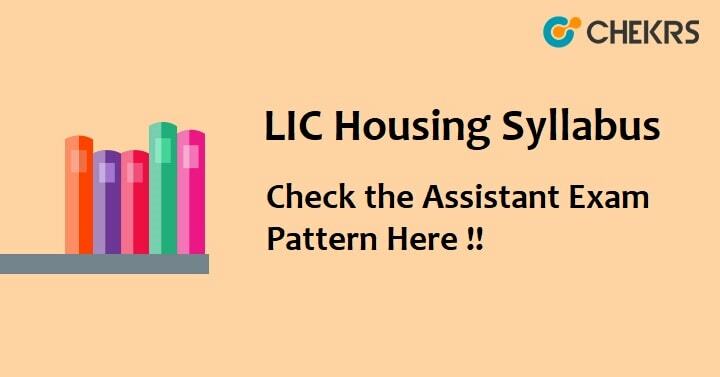 LIC Housing Syllabus 2018: LIC Housing Finance Limited will soon conduct the online examination to recruit the candidates on the vacant posts of Assistant, Associate and Assistant Manager. The LIC Housing Finance Limited Syllabus 2018 has been described in the later sections of our article. You should start your preparation with the help of the exam pattern which is available on the official notification. Cover the entire LIC Housing Syllabus 2018 for better results in the exam. The online examination will be separate for Assistant, Associate and Assistant Manager Posts. It will be in English language only. There will be penalty for wrong answers in the online examination. Only those candidates who rank sufficiently high on their respective Marks in Online Examination will be called for interview. Below has given the comprehensive form of the syllabus of the written online exam which will be conducted on 6th and 7th October on various centers. Give a deep look to it and prepare3 for the exam accordingly. The first requirement before any exam preparation is its syllabus. So, you need to check out the LIC Assistant Manager Syllabus in order to score good marks in the examination. Then, make an effective exam strategy with the help of the exam pattern and follow it. You can take the help of various Previous Papers to get the experience of the original paper. Remarks: For more queries regarding the LIC Housing Syllabus 2018, refer to the commenting section and drop all your doubts there. We will respond you with suitable answers as fast as we can.